Have you been hoping that your tooth pain will go away? 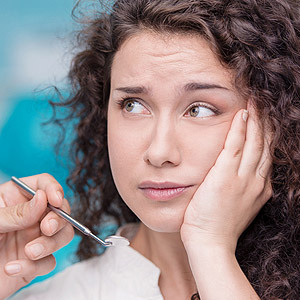 Ignoring tooth pain and other warning signs can affect your oral and general health and increase the risk that you'll need an extensive dental procedure to correct the problem. Fargo, ND, dentists Dr. Jon Anderson, Dr. Brad Anderson, and Dr. Breding of Anderson Dental offer dental emergency care for urgent oral health issues. Pain is a clear indicator of a problem with your tooth. If your pain is due to tooth decay, removing the decayed area and adding a filling will restore your tooth and end your pain. Overlooking a toothache may mean that you'll need a bigger filling. The longer you wait to see the dentist, the greater the chance that the decay will spread. If decay is severe, it could even affect your tooth pulp. If that happens, you'll need a root canal or you may lose the tooth. Common signs that may indicate you need a root canal include increased pain when you chew or put even the slightest amount of pressure on the tooth, darkening of the tooth, or redness, pain or swelling in the gum around the tooth. In some cases, tooth pain can be due to a dental abscess in the pulp. The bacterial infection may cause severe pain, fever, and pus around the tooth. Dental abscesses are dental emergencies and require immediate treatment with antibiotics to prevent the infection from spreading. Pain in a tooth may also occur for other reasons. It may be a sign that you have gum disease, a cracked tooth, a loose filling or other oral health problem. Unlike dental abscesses, these problems don't require emergency treatment but should be evaluated as soon as possible. Fractures: Fractured teeth can occur as a result of falls or a blow to the face and warrant an immediate call to your Fargo dentist. Knocked Out or Loose Teeth: It may be possible to reimplant knocked out teeth if you visit the dentist within about an hour after your accident. Loose teeth or teeth that have moved out of position as a result of trauma also require emergency treatment. Don't let tooth pain jeopardize your smile. Call Fargo, ND, dentists Dr. Jon Anderson, Dr. Brad Anderson, and Dr. Breding of Anderson Dental at (701) 232-1368 if you suffer a dental emergency.